Since 2008, Americans have been carefully watching for signs that the economy is improving. While we’ve long since left the most recent recession behind, the reality is that many of us are still looking for indications that the economy is truly on the track to a full recovery. 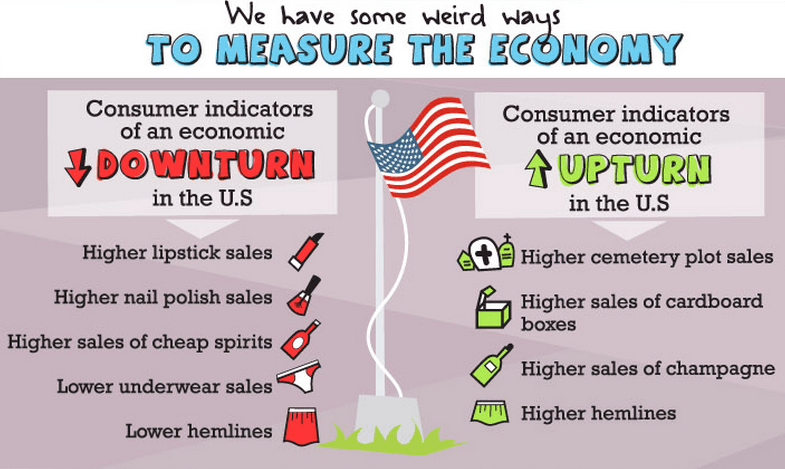 Some of the interesting correlations that researches have found to the economy include lipstick and nail polish sales, alcohol sales, and even the hemlines on skirts. If the economy is headed down, nail polish and lipstick sales tend to go up. This seems a little strange, until you consider what might be behind this trend. First of all, during a downturn, those who normally get manicures and pedicures are likely to cut those costs from their budgets. As a result, more nail polish is bought as manis and pedis are done on a DIY basis. Also, don’t forget that lipstick is a quick — and inexpensive — way for women to feel dressed up. I thought it interesting that sales of men’s underwear drop during an economic downturn as well. But when you consider that a tough financial situation often means that you need to make things do, and that underwear probably isn’t high on the replacement list when you are pinching pennies, it makes a little more sense. The alcohol also makes sense. During good economic times, champagne sales increase. More people feeling like celebrating. And, when times are good, that celebration often comes as the result of a pay increase or a promotion. A little bubbly makes a lot of sense. However, cheap spirits sell more during a downturn. When you want to drown your financial sorrows, but can’t afford to, a little cheap liquor is often the drink of choice. I also like the more people purchase cemetery plots and cardboard boxes during the good times. Both of these options are luxury items. When you have the money, and times are good, it’s easier to prepare for the future, and it might seem like a good use of money to buy a cemetery plot. Additionally, when you’re moving during tough times, you don’t usually waste money on buying cardboard boxes; instead, you pinch pennies and look for free sources of packing materials. I found this infographic interesting, since it provides you with a way to look around at your fellows on Main Street to get an idea of the way things are going. You don’t need official numbers to see whether or not your friends and family have changed their habits (although you probably don’t want to pay attention to their underwear-buying habits) and see whether enough of them are making changes that could indicate a change in the economy.